Shaun and I were in the hardware store On A Mission for a very important doohickey that he needed desperately. I happily followed along admiring all the fun eye candy. (Seriously, I like hardware stores!) When we came to a huge display of Easter Lilies, I stopped abruptly and just gazed at them. Shaun noticed that his trusty sidekick was no longer with him and came back to see what had piqued my interest. When he saw the big white blooms, he merely snorted and asked if I wanted one. (He’s romantic that way) I answered that I didn’t want one, I just wanted to look at them for a moment. I’m usually pretty good at ignoring the endless holiday merchandise that always seems to crowd the store shelves for some upcoming holiday. Of course, with Easter coming up, I will pick up a couple of chocolate bunnies, some jelly beans and my favorite chocolate malted eggs to nibble on for the girls’ baskets. Other than that, all those gaily wrapped Easter stuff doesn’t mean much to me. The only exception to this are Easter Lilies. It’s not so much that I adore this particular flower. If the truth be known, if it weren’t for the memories attached to them, I probably wouldn’t even notice them. Yet every time I see an Easter Lily, I think of my grandmother. Now I’m not sure that Grandma even cared for this traditional flower all that much. Still, every Easter, without fail, my grandpa would bring one to her. He would always take his time and select the prettiest plant of the bunch. Then grandpa would bring it home and present it, along with it’s foil covered pot and brightly colored bow to his bride. Grandma would always place it in a spot of honor for all to admire. I don’t remember my grandfather ever bringing home any other type of flower. He wasn’t really one for showy romantic gestures. It seemed as though he preferred to show his love in small, every day ways. I may be wrong, but it was always my impression that he brought home that particular plant because Grandma’s real name was Lillian. Lily for short. A few years ago, I planted a couple pots of Easter Lilies left over from the holiday in my flower bed, just to see what would happen. To my brown thumb’s amazement they thrived. Every year they poke their sleepy heads out of the earth and just start quietly growing tall. They are merely a backdrop of green behind all the other showy flowers. Then, when they are ready, almost without warning, the most astounding and fragrant white bloom takes center stage in my garden. My grandma was like that. Generally quiet and unassuming, she always seemed content to let her boisterous family have the limelight. When she was comfortable and ready to show her true self, she would do so with a flourish. When she wanted you to, you simply couldn’t miss the wonder that was my grandmother. It’s been nearly twenty years since Grandma died. I no longer think of her every day, but I still miss her…especially this time of year. While everyone is chewing off bunny ears and popping jelly beans graciously left by a certain over-grown bunny, I’ll be looking at my half-grown lilies and thinking of Grandma. And maybe I’ll snack on a couple chocolate malted eggs…just for her. 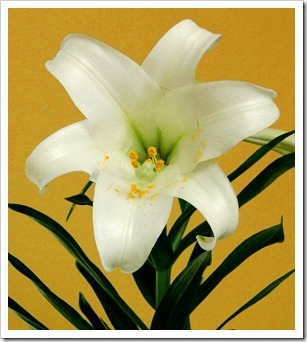 This entry was posted in Family, Love and Marriage, Traditions and tagged Easter Lily, Grandmother, romance, tradtions. Bookmark the permalink. What a lovely post and how wonderful that you can celebrate your grandparents every spring. I love your post Susan, it brings back such wonderful memories of my mother, your grandmother. May she live in our hearts all the days of our lives. I think I ate all the chocolate malted eggs in the universe, so I’ll be surprised if you can find any! I love the lilies for Lillian idea. And I love hardware stores, too! What a wonderful story and a lovely way to honor her memory.